Burrawang Dorper and White Dorper Stud’s star ram Piet was crowned supreme champion exhibit of the show, after first taking out the accolades for champion White Dorper exhibit and grand champion White Dorper ram. “We wanted to show the world what we’ve got,” he said. “There’s a lot of good progeny on the ground from Piet already. “He was born in 2015 and he’s given us a lot in that time. But a second show outing for Piet shouldn’t be expected any time soon, with Mr Cronje saying that the stud didn’t have any further show plans for the immediate future. “This is the national show, which is why we chose to come,” he said. “We’re thrilled with that, it’s probably the best results we’ve ever had. 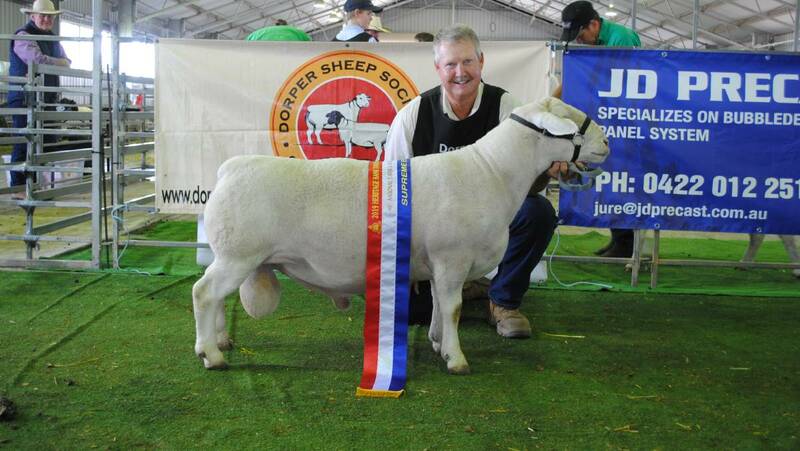 “We’re especially happy with our supreme Dorper exhibit being a ram. “We’ve won it with ewes before but never with a ram. Click here to read the full story by Victoria Nugent for the Queensland Country Life.